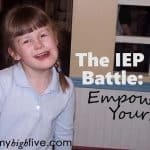 My 15-year-old daughter has special needs (autism as well as other disabilities). She has never been a good sleeper. After trying numerous different products, medications, and sleeping arrangements for our daughter, we finally came across an advertisement for a weighted blanket. After researching some more about weighted blankets, I knew I wanted to try one for our daughter. There was a bit of sticker shock when I saw the price, but I was ready for her to have some good sleep. We purchased a weighted blanket, and when it came, our 13-year-old begged to try it out before we gave it to his sister. He has always loved to have blankets piled on top of him. This time, he tried the weighted blanket and just one other lightweight blanket. The next morning he told me it was the best night’s sleep he’d had in a very long time. We had a hard time convincing him to give the weighted blanket to his sister, but he finally did. I am happy to say our daughter has been sleeping much better (and usually waking up less irritable) than ever before. Our son even talked us into getting a second weighted blanket for him to use, and he is also enjoying better sleep. A weighted blanket is just what it sounds like—a blanket with weights sewn into it. Think of it as a giant Beanie Baby. Weighted beads are sewn into a blanket to provide weight. Some say using a weighted blanket is like having a “good hug” while they sleep. It is similar to the feeling of wearing the weighted vest in a dentist’s office. 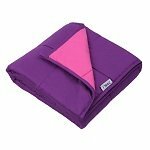 Weighted blankets bring comfort and sensory input that autistic and ADHD kids crave. By helping these kids to relax and sleep, weighted blankets are a miracle, according to many parents. How much weight is the correct amount? Adults should choose a blanket that is approximately 7-12% of their body weight. 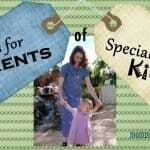 For children, the ratio is 10% of their body weight plus 1-2 pounds (A 50-pound child should use a 6-7 pound blanket. A 150 pound adult could use a blanket 11-18 pounds). It is not recommended to use a weighted blanket on children under the age of 3. Typically, the heavier a weighted blanket is, the larger the blanket (a 3 pound blanket is very small, while a 25-pound blanket would fit a king size bed). Is a weighted blanket just for sleeping? Parents find a weighted blanket can be helpful in calming an anxious or upset child. Teachers have found using a weighted blanket or weighted vest in the classroom can help students stay on task better than without the blanket. In a study by Nancy L. VandenBerg, four students with attention difficulties wore weighted vests in the classroom. She found that the students’ on-task behavior increased by 18% to 25% when the students were wearing the weighted vests, and the students asked to wear the vests at times other than during observation sessions. These students benefited from the deep pressure provided by the vests. Type of bead. Glass beads or pellets are preferable to sand or plastic beads. Plastic beads often contain toxic material or have an off-putting odor. blanket itself is important. You want a high-quality fabric that will not tear or wear out, causing beads to spill out. Some blankets come with a cover that causes the user to sweat. Sewing. How the beads are sewn into the fabric makes a big difference. Generally, the smaller the pockets holding the beads, the better the weight will be distributed and the more the beads will stay in place. Weight. Follow the weight guidelines listed above. Be aware that at first, the blanket will feel heavy until the user gets used to it. 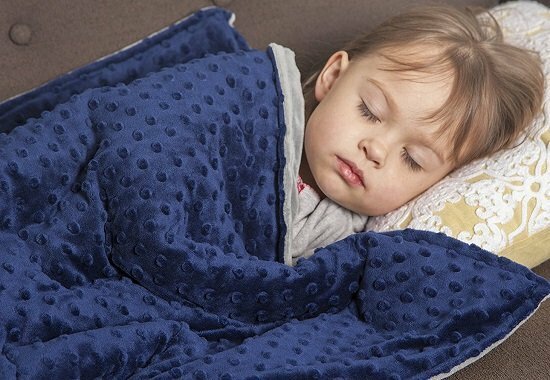 This high-quality blanket from Roore is made of non-toxic glass pellets which are evenly distributed throughout. The Minky soft outer cover zips on and off. The blanket and cover are machine washable. Customer service is fantastic, and the manufacturer has a good refund policy if you are not fully satisfied. While the website says this blanket is for kids around 50 pounds, industry standard is that for children the weight should be 10% of their body weight plus 1-2 pounds. Therefore, this blanket would work for a child as light as 30 pounds. This product weighs 5 pounds and measures 36″x48″. The ZonLi Sensory Weighted Cool Blanket offers the benefit of a weighted blanket without the heat that some others give. 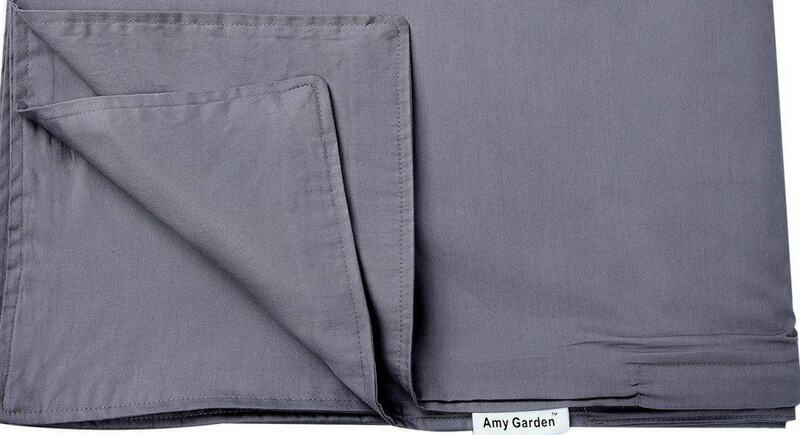 The 100% natural cotton cover comes in a variety of colors. It has straps to keep an outer cover in place (outer cover has to be purchased separately). This is a good quality option with the weight evenly distributed. It contains polyester padding and non-toxic, hypoallergenic glass beads. At 5 pounds and 36″x48″, this is a good choice for a toddler. This lap pad is great for school, homework, car rides, reading, etc. It provides deep pressure which helps kids with autism and ADHD to better concentrate and calm down. One side of the soft Minky fabric has raised dots, which provide tactile input. When you purchase a Harkla Sensory Weighted Lap Pad, 1% of sales go to the University of Washington Autism Clinic. This product is machine washable and has a lifetime guarantee. It does not require an additional cover. It weighs 5 pounds and measures 21″x19″. A speech therapist created the Reachtherapy Solutions Weighted Sensory Lap Pad. It comes in either 3 pounds or 5 pounds. There is Minky fabric on one side and a cotton print on the other, with several fun options to choose from. The weights are high-density poly pellets. No additional cover is needed, and the lap pad is machine washable. For best results, place lap pad in a wash bag and wash on gentle cycle. 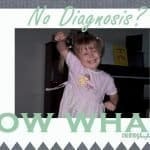 Reachtherapy Solutions offers a money back guarantee if you are not satisfied. The 3-pound version measures 17″x14″ and the 5 pound one is 18″X21″. The Hypnoser Weighted Blanket 2.0 comes in options from 3-20 pounds, which means it has the right option for your child or for you. The exterior is cotton, and it is filled with 100% non-toxic glass pellets. The pellets are sewn into small pockets, which ensures a good even distribution of weight. The small pockets also keep the pellets in one place, instead of the pellets shifting to the corners, as they do in some weighted blankets. This blanket is good quality. The manufacturer provides a two-year warranty. covers listed at the end of this article. The YnM Weighted blanket comes in options from 7 to 25 pounds. It is filled with small, non-toxic and odorless glass beads. These beads are quiet so they will not wake you up if you move in the night. While the bead pockets in this blanket are slightly larger than in others, the YnM Weighted Blanket does keep the beads pretty well in place. The blanket comes in 4 different colors. The manufacturer says you can wash the blanket in your washing machine, they recommend dry cleaning. They also recommend using a cover for this weighted blanket. The blanket itself has loops on it to connect it to a cover. This is great because it keeps the blanket from falling down inside the cover. recommend. 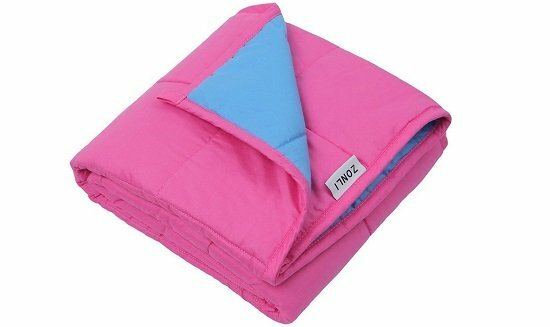 This blanket is good quality and is well made. It will help provide a good night’s sleep! inner layer is made up of small sections containing glass pellets. The pellets stay well in place. weighted blanket has no way of attaching to the removable cover, which results in the weighted blanket falling to the bottom of the cover. This blanket is a decent choice. 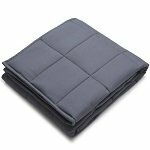 However, if you are looking for a weighted blanket that will last the test of time, go with one of the other choices on this list. 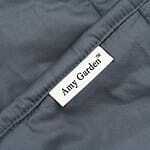 The Amy Garden Weighted Blanket is another good option. With blankets ranging in weight from 5 to 20 pounds, there is sure one that will work for any member of your family. The blanket is filled with hypo-allergenic, non-toxic, odorless glass beads. The beads are sewn into small compartments, to assure the beads stay in place and give you the good sleep you need. The manufacturer recommends dry cleaning this weighted blanket. Using a removable cover is also encouraged. Amy Garden also makes a removable cover that works perfectly with this blanket. 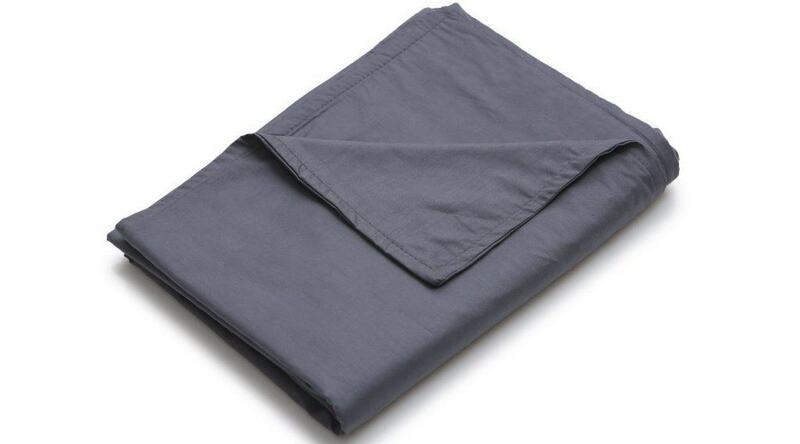 This removable cover is made of ultra-soft cotton. It has a zip closure as well as ties in the corners and the middle to keep the weighted blanket in place. Unlike some other fabrics, the cotton keeps the user from getting too hot. This cover is machine washable. protect your weighted blanket. It is good quality and less expensive than many others. Both the cotton and Minky covers are of good quality. However, the Minky fabric tends to make the user very warm. I would recommend going with the cotton cover instead. 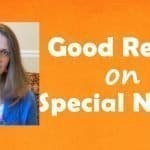 A weighted blanket or lap pad can bring better rest and concentration to kids with autism or ADHD. In our house, it has worked wonders. The deep pressure seems to work like magic in calming an otherwise restless mind and body. If you have a kiddo with autism or ADHD, try a weighted blanket or lap pad and see how things improve!